This fact sheet provides information on angiograms of the brain. This fact sheet provides information on cerebral angiograms, which are angiograms of the brain. Our fact sheets are designed as general introductions to each subject and are intended to be concise. Each person is affected differently and you should speak with your doctor or specialist for individual advice. An angiogram is a type of X-ray test used to produce pictures of blood vessels. 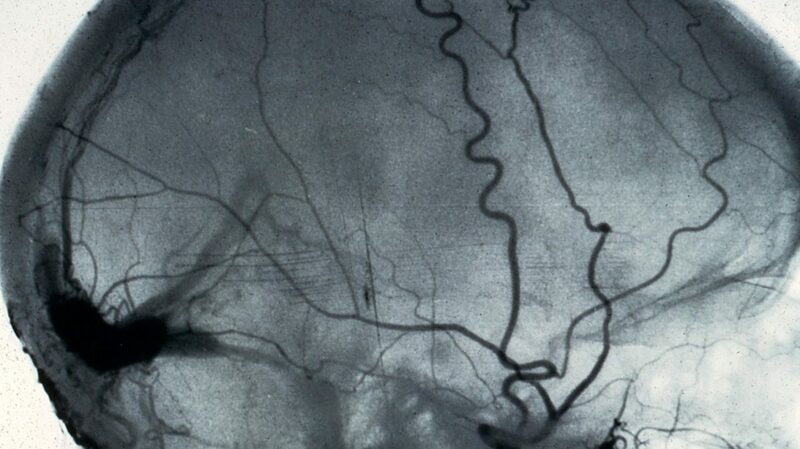 A cerebral angiogram shows the blood vessels in your head and neck. A doctor will ask you about your medical history and any medication you are taking, and will explain the test to you. They will ask you for your consent for the test. If you are too unwell to give your consent, the procedure will be discussed with your family. You will probably be asked not to eat or drink for four to six hours before the test. The test is carried out in the radiology department in a room with large, high-tech computerised equipment. You will be asked to lie on an X-ray table in the room. The doctor or nurse will put sterile towels over you and clean an area of your groin. The radiologist will give you an injection of local anaesthetic to numb your groin so you will not be able to feel what is going on. The radiologist will then put a very small tube, called a ‘catheter’, into the main blood vessel in your groin (the femoral artery). The catheter is guided through other blood vessels in your body until it reaches the blood vessels in your neck that supply the brain. You will not feel it moving inside you. When the catheter is in the right position, the radiologist will inject a special dye through it (called contrast agent), and some X-ray images will be taken. Blood vessels don’t normally show up on X-rays, but this dye makes them visible. Before taking the first picture, the radiographer will move the X-ray equipment into the correct position. The radiologist will reposition the catheter in different blood vessels in the neck, and take more sets of X-rays with further injections of dye. The injections may give you a general warm feeling, but this goes away quickly. It is very important that you remain still throughout the procedure to ensure the pictures taken are as clear as possible. The whole procedure is likely to take at least one hour. When all the X-ray images have been taken, the catheter in your groin will be removed by the radiologist. The point where the catheter was inserted will be pressed on for up to 10 minutes to seal it and stop any bleeding. After any bleeding has been stopped, you will be transferred on to a bed and taken into the recovery room, or directly back to the ward. You might be allowed food and drink, but you will have to lie flat for four to six hours after the test. Nurses will closely monitor you, and check that there is no further bleeding from the small wound in your groin. As long as there is no bleeding and you are recovering well, you will usually be able to go home on the same day. It is quite common for there to be some bruising and soreness around the place the catheter was inserted. This might last for a few days following the angiogram and is completely normal. You will usually be able to get back to your normal activities the day after the procedure. However, you should avoid doing anything strenuous for at least 48 hours after you have been discharged. Your doctor or nurse will be able to give you individual advice. Doctors may be able to discuss the results of the angiogram with you before you go home. However, you may have to wait longer, as doctors often need a few weeks to study the X-ray images. This information was last checked in March 2017. Due for review in March 2020.